Rebecca Ayoko, a former muse of internationally renowned designer Yves Saint Laurent, spoke frankly about overcoming the violence she endured as a child and her dream of starting her own business with the help of Led By Her, a non-profit organization that seeks to encourage women’s entrepreneurship by providing vulnerable women with access to the education and tools necessary to succeed in their projects. Now Led By Her is helping Ms Ayoko develop the business skills needed to get her African food business up and running. The entrepreneurship programme, currently in its 4th year, has already benefitted over 200 women, all victims of violence or difficult personal circumstances. “Once she comes through our door, we move her forward,” said Led By Her Secretary Claire Mays who introduced the programme and explained how it helped women to realize their full potential by transforming their talents, passion and experience into business competencies. Sustainable Development Goal number five – Gender Equality – has been identified as one of five priority goals for ICC to advance via daily activities at its Paris based headquarters. A recent report from McKinsey found that $12 trillion could be added to global GDP by 2025 by advancing equality of women and ICC believes that the private sector has a vital role to play in accelerating progress towards women’s economic empowerment and recognizes the capacity building and training work that the private sector is already involved in to equip women them with the necessary skills to participate in the workforce or to create their own businesses. 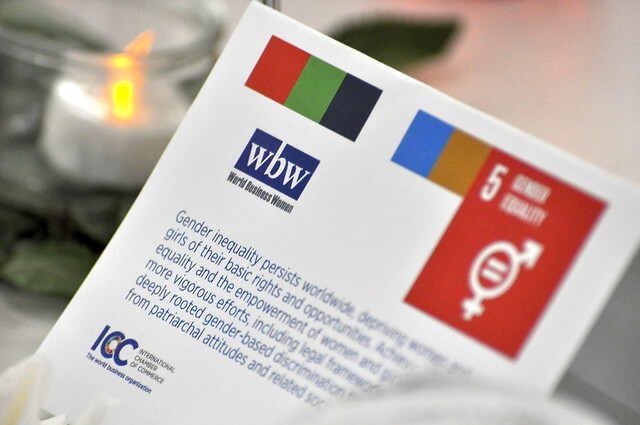 In the coming months, ICC’s staff driven WBW initiative aims to work with Led By Her to raise awareness of the Global Goals through its entrepreneurial programme. The lunch event, the latest in a series hosted by WBW, took place on 5 October at ICC headquarters in Paris.